We arrived at 1000 so were early to the Snake Pit site. The weather has abated and our expedition leader, Tito, has given the go for a dive commencing at 1600 hours. Our scientists are getting all of our sensors and sampling gear on the Jason and the elevator after a night of analyzing the samples at TAG. We expect to be at Snake Pit for the next 4 days before returning to TAG. At 1020 we did our week ly fire and boat drill training for emergencies at sea. At this time, we wear our life preservers and bring our immersion suits to our muster station in the main lab so all can be accounted for after the alarm has sounded. 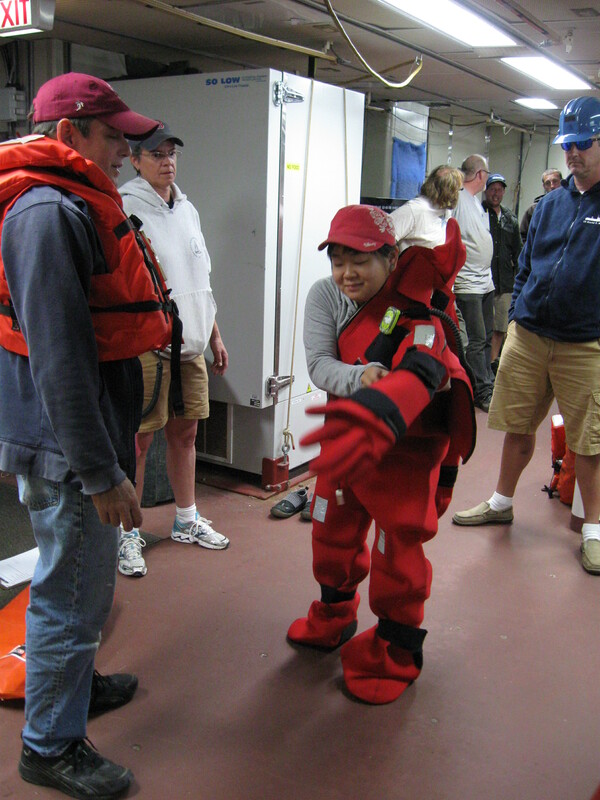 In this photo, Juliana Letterie demonstrates how to get into an immersion suit, which saves lives at sea. It is easier if you have someone help you put it on. If the people on the Titanic had such gear available, they would have been saved even in the cold waters of the North Atlantic.